Some of you might remember that I recently discovered Pear PC. 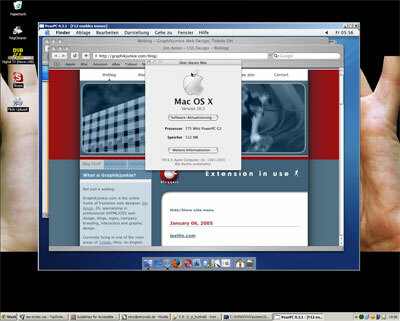 Pear PC allows to run a Mac OS under Windows XP. As this makes for an incredible useful browser cam, it admittedly has some downsides. One of them was the emulation being very slow. The other problem l had was that I couldn't use the internet connection of the host computer. Every time I wanted to check a project on a Mac browser I had to create an isofile and make it appear as a virtual CD volume by assigning it to the Pear PC config file. I am very glad to tell you that internet connection is no longer a problem. With the new version of Pear PC 0.31 and MacOSX 10.3 it is now very easily possible to share files and internet connection using a proxy on the Windows machine and the SMB protocol. Additionally, the speed problem was addressed. It still isn't a very fast emulation but browsing the web is now quite acceptable. 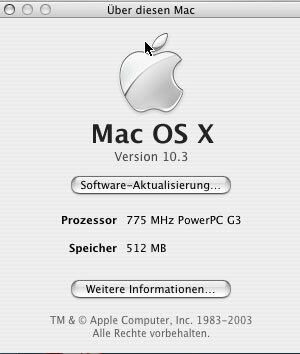 As you can see on the screenshot above MAC OSX identifles my Pentium 4 computer as a G3 PowerPC. All in all I am very content with my own browser cam, how being able to use Safari 1.2, IE 5.2, Firefox 1.0 and Opera 7.5. Otherwise, please don't hesitate to drop me a line.